2018 Chevrolet Camaro Trim Levels with Comparisons & Configurations. What 2018 Chevrolet Camaro Trim Level Should you Buy? What is the Difference Between Trims? Over the past several decades, Americans have fallen in and out of love with minivans, SUVs, crossovers, and many other types of cars, but one segment that never goes out of style is the muscle car. The Chevrolet Camaro has been a popular vehicle both in its original incarnation as a muscle car in the 70s and 80s and in its revived form that debuted in 2010. As is proper for a muscle car, it offers a full range of engines, from a potent turbocharged four-cylinder all the way up to one of two awesome V-8s. It also comes with a good selection of equipment as well, to make the trips to the beach or the track comfortable and fun. The ability to select between a coupe body style and a convertible is also attractive to many enthusiasts. The Camaro has not changed much since the sixth generation of the model entered production in 2016. The 2017 model added a new performance package option to the lineup, as did this year’s 2018 Chevrolet Camaro. To help drivers who are interested in the Camaro navigate the various options available, we have reviewed each of the car’s six trim levels, pointing out the differences between the various models and describing the optional features that can be found on each one. Compare the 2018 Camaro 1LS vs 1LT Trims. What is the difference? The base 1LS model, as well as the two LT models that follow it, comes standard with a 2.0-liter turbocharged four-cylinder engine. It is a pretty good powertrain at 275 horsepower, but it is just a start as far as the Camaro is concerned. For an extra $1,500, it can be upgraded to a 3.6-liter V-6 with 335 horsepower. The list of standard features on the base Camaro is pretty extensive, as is the options list. The 1LS comes with cloth seats and all the power options, as well as powered front seats. LED running lights, 18-inch alloy wheels, and a 7-inch infotainment system with Android Auto, Apple CarPlay, Bluetooth, and a 4G LTE mobile Wi-Fi hotspot. It comes with a six-speed manual transmission, and it is the only available transmission option. To get the automatic transmission, drivers have to move up to the 1LT trim level. In terms of options, the list of available 1LS packages is impressive, though most of them are focused on looks. The Performance Enthusiast Package comes with Performance-branded central console cover, wheel center caps, and floor mats, as well as a suspension lowering kit. It is available with either red or gray accents. The Redline Edition adds 20-inch wheels, and a black-and-red set of exterior accents, including darkened tail lights and a red contrast grille, as well as specially branded floor mats. The RS Package adds a different set of 20-inch wheels, a spoiler, high-intensity discharge headlights, LED tail lights, and a different unique grille. It can be further enhanced with an RS Interior Package adding RS logos to the inside of the car. The Black Exterior Appearance Package adds black accents to the outside of the car, such as the grille and the front fascia. This package also comes with a spoiler. The Camaro Insignia Package and the Camaro Logo Package both add a Camaro badge to the fender and include premium Camaro-branded floor mats. The Insignia Packages matches it with a painted engine cover, while the Logo Package has a Camaro-branded center console lid. The Black Interior Appearance Package adds black suede knee pads and extra black interior trim. The Winter/Summer Floor Mats Package adds carpeted floor mats with the Camaro logo and a set of all-weather floor mats. Beyond the appearance packages, the Camaro 1LS also offers a few feature and performance upgrades. The V6 1LE Track Performance Package is designed to give drivers extra power out of their V-6 Camaro. Only available on the V-6 model, it adds heavy-duty engine cooling, a performance suspension, performance exhaust, a limited slip differential, Brembo brakes, and HID headlights. It also adds a number of appearance features, including 20-inch wheels, black exterior accents, a front air splitter, and a rear spoiler. The other available upgrade is the Technology Package, which upgrades the infotainment to an 8-inch screen and adds a 9-speaker Bose sound system. The 1LT is almost identical to the 1LS, except for four differences. 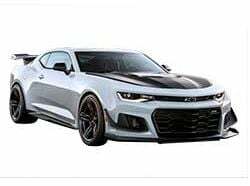 It is $900 more expensive, it comes with an 8-speed automatic transmission with steering wheel mounted paddle shifters, has a standard remote starter, and it is not available with the V6 1LE Track Performance Package. The V-6 is still available on the 1LT, even without that package though. Otherwise, both the standard features and the options are exactly identical between the two models. The choice between the 1LS and the 1LT model ultimately comes down to the transmission. Buyers that like the automatic will opt for the 1LT, while the more hands-on ones will choose the 1LS. Compare the 2018 Chevrolet Camaro 1LT vs 2LT Trim Levels. What is the difference? The 2LT is not a performance upgrade over the 1LT, but a comfort one. It comes standard with all of the 1LT features with the exception of the transmission. The six-speed manual is back, but it can also be upgraded to the 1LT 8-speed automatic with shifting paddles as an option. The 2LT has a standard leather interior, and the front seats are heated and ventilated. Dual-zone climate control and a frameless auto-dimming mirror are standard, as are the optional 8-inch touchscreen and Bose audio from the 1LT and 1LS models. Aside from the Technology Package, which is included in the 2LT standard features, the 2LT offers the same packages as the 1LS. The V-6 Track Performance Package is also available on the 2LT, though only with a manual transmission. The 2LT also adds three of its own appearance packages. The Hot Wheels Edition comes with a unique exterior color and a set of flashy accents both inside and out. It also has 20-inch wheels, and includes the RS Package and the high-performance Brembo brakes. The other two appearance packages are the Interior Accent Trim Packages, which add accents to the interior trim. They come in an Adrenaline Red and Ceramic White variations. A navigation system is also available as a standalone upgrade. Perfect for drivers who like to be comfortable while they drive, the 2LT feels like a fairly plush model, though the seat upholstery feels much more upscale than the rest of the interior trim. Still, it is one of the few options to getting high-end comfort features on the Camaro, and the only one that is available without getting a much more expensive model with a stronger engine. It is the best choice for those who favor the Camaro more for its style than its performance. Those who don’t care about comfort and just want a strong engine are advised to choose the 1LT, 1LS, or the higher 1SS model instead. Compare the Camaro 1LT vs 1SS Trims. What is the difference? The 1SS model is fairly similar to the 1LT, offering a different upgrade path. Instead of the upscale features of the 2LT, the 1SS replaces the standard four-cylinder or V-6 engine with a 455-horsepower V-8 engine. It has a suitable set of performance upgrades, including 20-inch wheels with high-performance summer run-flat tires, Brembo performance brakes, and an upgraded instrument cluster. Aside from that equipment, it is equipped with the same features as the 1LT model, though it also gets the 8-inch infotainment screen and the high-intensity headlights. A six-speed manual transmission is standard, but the 8-speed automatic is also available. The 1SS has many of the same optional packages as the earlier models. The Performance Enthusiast Packages, Redline Edition, Black Exterior Appearance Package, Camaro Insignia and the Camaro Logo Packages, the Black Interior Appearance Package, and the Winter/Summer Floor Mats Package are all available on the 1SS. In addition to those, the 1SS offers some of its own options. The SS 1LE Track Performance Package is going to be a top choice for performance enthusiasts. It adds a front splitter, rear blade spoiler, special 20-inch wheels, Recaro performance seats, upgraded Brembo brakes, a heads-up display, performance-tuned suspension, an electronic limited slip differential, and magnetic ride control. It can be further upgraded with the 1LE Spec Suspension Package, which tunes up the suspension and the magnetic ride control settings further for better performance. The Performance Handling Package does the same for the other driving dynamics. Finally, the SS Interior Package adds SS logos and accents throughout the interior. The 1SS Package nearly doubles the power of the Camaro compared to the base four-cylinder engine, and provides an ample boost over the V-6, but it comes at a roughly $10,000 price increase compared to the similarly-equipped 1LS and 1LT models. However, that is easily worth it to the performance-focused drivers that are likely to be considering this trim level. For drivers who don’t consider performance important, there is little reason to consider this or other higher trim levels over the 2LT. Compare the Camaro 1SS vs 2SS Trim Levels. What is the difference? The difference between the 1SS and the 2SS is almost the same as the differences between the 1LT and the 2LT. The 1SS is the base model introducing the more advanced engine, while the 2SS adds comfort amenities to that base. All of the 2LT standard features are included on the 2SS as well, such as the heated and ventilated leather seats and Bose audio. It also adds its own touches, such as improved interior decor, a heads-up display, blind spot monitoring with rear cross traffic alert, rear parking assist, wireless charging, and a setting memory for the driver’s side seat and mirrors. A manual transmission is standard on this model and the automatic transmission is optional, just like on the 1SS. The optional packages available on the 2SS are a mix of the ones found on the 1SS and those found on the 2LT. Buyers can choose from the 1LE Track Performance Package, the Hot Wheels Edition, the Performance Enthusiast Packages, the Redline Edition, the 1LE Spec Suspension Package, Black Exterior Appearance Package, Performance Handling Package, Camaro Insignia and Logo Packages, the SS Interior Package, the two Interior Accent Trim Packages, and the Winter/Summer Floor Mats Package. It introduces no new packages of its own. The 2SS is the Camaro for those who like both style and performance. This is the trim level for those who like the V-8 power of the 1SS but can’t bear to leave behind the luxuries added by the 2LT. The jump in price is a little higher from the 1SS than the one from the 1LT to the 2LT, but that is the nature of these high-power trim levels. For the best Camaro experience short of the tremendous ZL1, this is the trim to choose. Compare the 2018 Camaro 2SS vs ZL1 Trims. What is the difference? The ZL1 is the halo car of the Camaro lineup - a rare super-high performance model that is simply impractical to use for ordinary everyday driving. The Camaro ZL1 comes with a supercharged version of the 6.2-liter V-8, which brings it to 650 horsepower. Most of the features added by the ZL1 over the 2SS feature set focus on improving performance. It has its own special body kit that includes cooling ducts, wide fenders, carbon hood air extractor, and a stanchion spoiler. It also has an electronic limited slip differential, a performance traction manager, high-end Brembo brakes, a short-throw shifter for its six-speed manual transmission, and high-performance Goodyear tires. Inside, it has a racing steering wheel, and a black-and-red interior with Recaro performance seats. A 10-speed automatic transmission with paddle shifters is available for those who prefer not to shift themselves. Compared to the other Camaros, the ZL1 has a relatively short list of options. The ZL1 1LE Track Performance Package adds a unique front splitter and replaces many components like the spoiler with carbon fiber versions. It also adds dive planes to provide the car with better traction and a performance suspension system. The other package option is the ZL1 Protection Package, which adds premium ZL1 floor mats and a car cover. For superior track performance, this is the Camaro to choose. This is far above the comfort level and the price point of most buyers, but for racers and performance car collectors alike, this is quite a desirable model. When selecting the right 2018 Chevrolet Camaro, the first question prospective drivers should ask themselves is how much power they need. If they are looking for something strong that still feels like a typical car, the 1LS, 1LT, and the 2LT trim levels with their four- and six-cylinder engines are likely to be the best choice, with the 2LT offering extra comfort options. If a mix of track power and everyday power is called for, the two SS trims are a good choice, with the 2SS once again being the choice for the more comfort-oriented features. Finally, the ZL1 is the top of the lineup with a performance engine optimized for track racing.